This training is the first step to becoming a Zumba® Instructor, and it teaches you the foundation and formula to teach Zumba® classes! Learn how to teach the basic steps to the four Zumba® core rhythms: Merengue, Salsa, Cumbia, and Reggaeton. Using the Zumba® formula, learn how to identify different parts of a song and apply the basic steps to build an effective Zumba class. Practice live with a Zumba Education Specialist to gain confidence to teach sooner. Receive your license to begin teaching Zumba® classes immediately. Get access to even more tools to help you start teaching faster and changing lives sooner. Get the opportunity to receive monthly choreo and music + ongoing support. Relying on proven HIIT methods, but with a Zumba twist, we call our program HITTZ—High Intensity Tempo Training—Zumba style! The strength of the beat challenges you to find power, strength, speed, stamina, and mobility. Optimize your workout and make every minute count as you push beyond your limits. Join the party and get fit. Sponsored by ZUMBA® FITNESS. Eliza has been in the fitness industry for 20 years, teaching a variety of fitness formats. She is a Zumba Education Specialist and Zumba Instructor since 2002 presenting such trainings as Zumba Basic Skills, Zumba Gold, and Aqua Zumba. Eliza is an international presenter for Zumba Fitness, presenting at all major conventions, she is also a Registered Dietitian, Personal Trainer and has appeared in many Zumba DVD’s. ACE, AFAA and AEA certified. Alex McLean has been teaching group fitness since 1995. He started as a dancer and master class presenter for the Reebok® Performance Team and Nike® Culture Shock. Currently, Alex is an educator for three global brands: Strong by Zumba™, TRX® and Schwinn® Cycling. He was a featured master trainer for the Strong by Zumba™ consumer DVD and has appeared in video and print projects for TRX®, Under Armour® and Total Gym®. Alex is certified in group fitness and personal training by ACE, AFAA and NASM. STRONG by Zumba® is a revolutionary high-intensity workout, led by music. Body weight, muscle conditioning, cardio and plyometrics are synced to original music designed to match each move. Think you have what it takes? 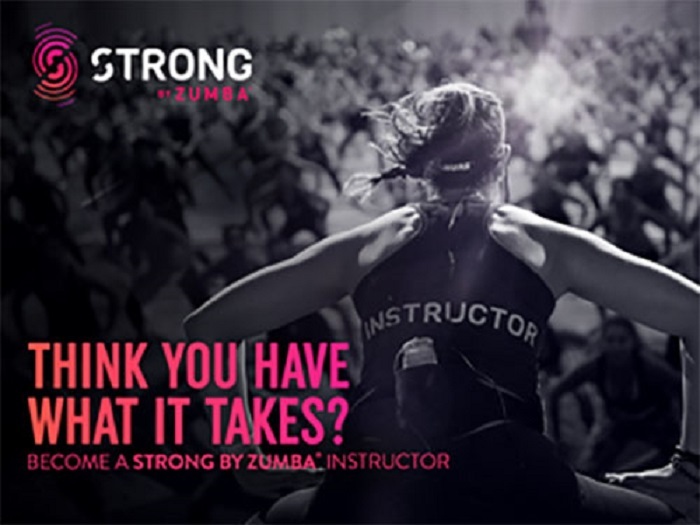 Join the STRONG by Zumba® Master Class and find out! TAKE ADVANTAGE TO BE PART OF OUR STRONG BY ZUMBA CHALLENGE TO WIN PRIZES.